Dental implants are one of the most important developments in modern dentistry has been the ability to replace missing teeth using titanium implants placed directly into the jaw bone. Will the dental implant always fuse to the bone? Dental implants are used to support false teeth. If you have lost a tooth and you are concerned about how your teeth look and feel then a dental implant is one of the best cosmetic treatments available to restore your smile. When the root of your tooth fails your tooth can fall out. When this happens, we can use a dental implant as it is a titanium screw, which fixes into your jawbone alongside the roots of your natural teeth. From one tooth up to a whole arch, or simply to stabilise a moving denture, implant dentistry can offer a successful alternative to many restorative problems. The security and comfort of a fixed restoration which looks and functions like the real thing and does not have to be taken out cannot be overemphasised. We use only the very best in dental implants systems - either Southern or Biomet 3i. For further information on Dental Implants in Edinburgh please contact a member of the Marchmont Dental Care team on 0131 229 5542 or fill in our enquiry form here. During your consultation, we will be able to give you a timetable specifically tailored to your treatment. Usually, we will be able to fit your false teeth around 3-4 months after your implants procedure. If the process takes longer for you than expected, we will tell you but this is usually a safe and realistic timeframe for dental implants. The implant procedure takes time because the bone in your jaw needs time to grow and fuse to the implant. We can talk about pairing up your treatment with temporary dentures if you are concerned about having a gap in your teeth whilst you wait for the implant to fix permanently into place. Dental implants are artificial replacements for your tooth roots that are placed within the bone of your jaw. In some patients there is not enough bone in their jaw to allow dental implants to be inserted. In cases where a lot of bone is needed, it may be possible to rebuild the jaw using bone taken from another part of your body, usually your hip. This is called a major bone graft. This depends on how well you look after your teeth once the procedure is complete. You may have a gap in your teeth for a number of reasons, but if it is due to poor oral hygiene, we would recommend regular visits with a hygienist. Dental Implants are a well-established treatment. If you look after your dental implant you can expect it to last as long as your natural teeth. We would recommend that you attend regular routine visits to Marchmont Dental Care after your treatment. It is rare for an implant to not fuse to the bone. 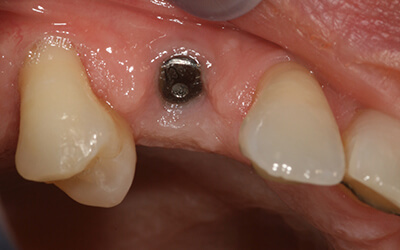 If the implant is loose during the healing phase, we can easily remove the implant and replace it with another. 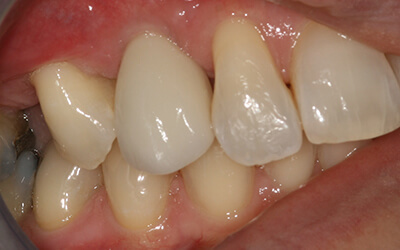 We could also look at an alternative treatment, such as a dental bridge. In the vast majority of cases, we won’t need to look at a different option. Our implant supported crowns start from £2,150. You will need to be booked in for an assessment. Remember to talk to us about our 0% interest-free finance and low-cost finance options. With our 0% facility, you pay the costs of your treatment - no more and no less. Interest free means just that! In terms of the low cost facilities, we provide you with a quotation that shows the monthly payment and the total interest payable over the term of the loan. There are no hidden costs and no deposit required! Click the image below for the Chrysalis Finance Calculator and see how much your treatment will cost. Book a Dental Implant Consultation - contact the practice on 0131 229 5542 or fill in our enquiry form here.